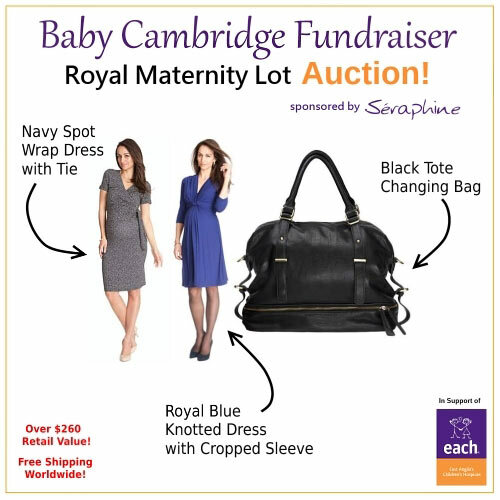 Our next Baby Cambridge Fundraiser activity is the Royal Maternity Lot - an eBay for Charity auction. The lot includes three stunning items from royal favourite maternity brand Séraphine. As always 100% of the proceeds go to Kate's patronage East Anglia's Children's Hospices. The first item in the lot is one readers of the blog will be familiar with: the Renata Wrap Dress with Tie. The mock wrap design creates pleats across the bust area and the pull aside V-neckline is perfect for breastfeeding. The dress comes in sizes 8-18 and the winning bidder can choose their own size. The Duchess wore the navy spot dress during a recent shopping trip and teamed it with a pink cardigan. The second item in the lot is the elegant Royal Blue Knotted Dress. As you can see it's remarkably similar to Kate's Issa engagement dress. The £49 dress exudes opulence without compromising on comfort in soft silk-like-jersey. The Séraphine Tote Changing Bag is the ultimate accessory for mothers and mothers-to-be. 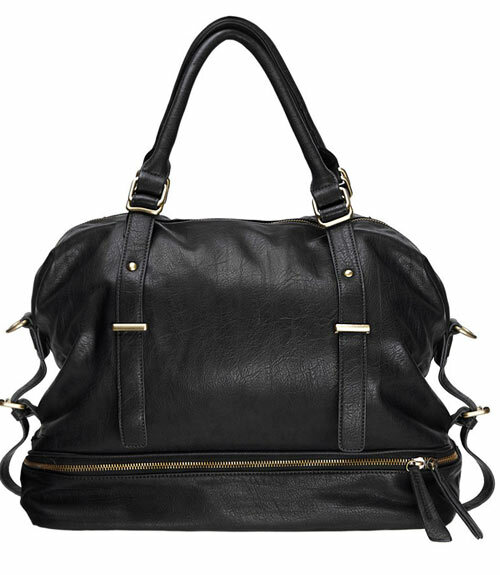 Made in wipe clean faux leather with subtle brushed gold hardware, this stylish piece is deceivingly lightweight and waterproof. The £75 bag is a lifetime investment that transforms effortlessly into a chic work bag to carry your laptop and other possessions long after toting around your baby's luggage. 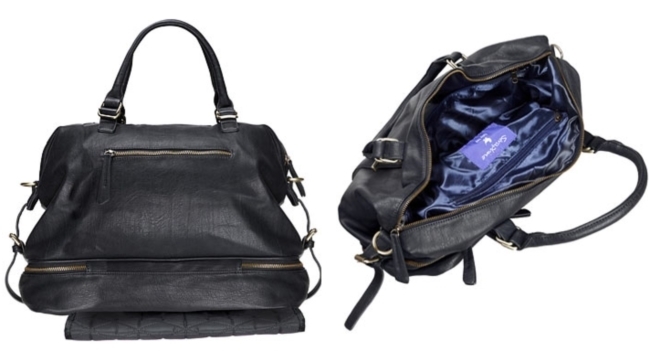 The waterproof piece comes with a detachable changing mat and five roomy interior pockets. The Duchess has bought several maternity dresses from the brand, since she was linked with the company in March. 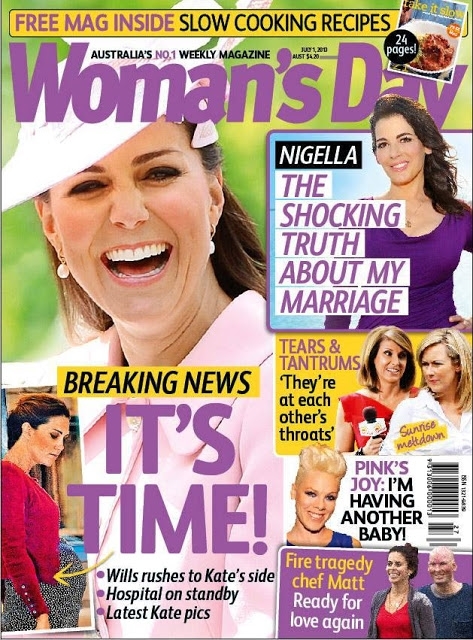 Below we see Kate on the cover of WHO magazine wearing the Séraphine White Maxi Skirt. Séraphine has stores in Kensington and Hampstead, and concession stores in John Lewis and Peter Jones (two of Kate's favourite haunts) and has been worn by a number of celebrities including Angelina Jolie, Halle Berry and Jessica Alba. Below we look at four stylish dresses from the Luxe Collection. Shoppers can receive up to 50% off a wide array of items in the Summer Sale. To celebrate the royal birth Séraphine are offering a £1,000 wardrobe to the person who correctly guesses the baby's name. You can enter by clicking here. 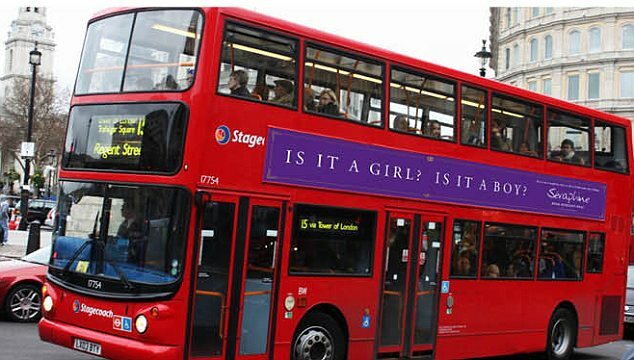 The retailer has launched an ad campaign on London buses with the words 'Is it a girl? Is it a boy?' (the question on everyone's lips) between July 1st and July 15th. Many thanks to Séraphine for their generous donation and best of luck to all bidders! :) The auction can be viewed here. The Duke and Duchess of Cambridge have given their seal of approval to memorabilia being produced to celebrate the birth of their baby. The royal birth is expected to generate £243 million in the coming months and not surprisingly £80 million of that sum will be spent on souvenirs according to experts (almost £200 million was spent on royal wedding souvenirs). Let's take a look at a selection of memorabilia already hitting the shelves at retailers around the globe. 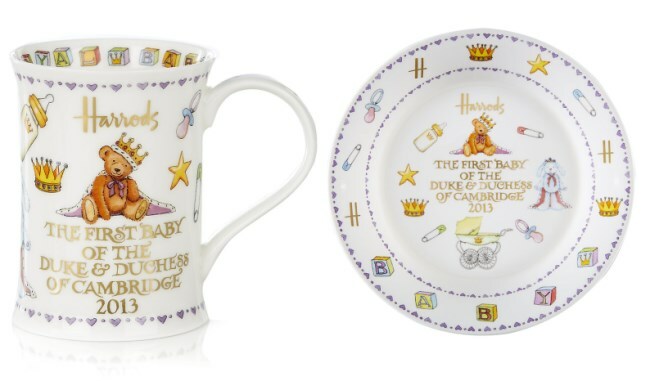 Harrods have released a £20 Royal Baby Mug and a £30 Commemorative Plate to mark the occasion. 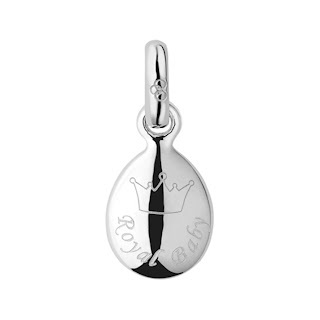 One of Kate's favourite jewellers, Links of London have produced a Hope Royal Baby Charm. There are a number of commemorative items available at John Lewis including Trollbeads and Gingerbread Biscuits. 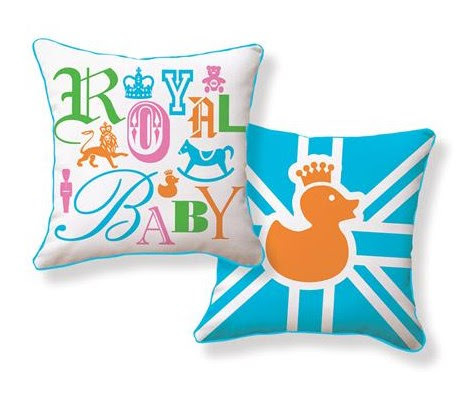 The Royal Baby Pillow is a nice item for those who prefer practical items over commemorative pieces. Even Krispy Kreme are getting in on royal baby fever - selling limited edition doughnouts with pink or blue centres. Judith Denby, head of marketing said: "Customers have no way of knowing what centres they will get when they buy them in store, but judging by the poll we've been running pink ones are outselling blue ones by a long way." What do you give a Prince for his birthday? No doubt Kate has plenty of experience choosing the perfect gifts for William and for his 31st birthday on June 21st the Duchess reportedly gave her husband a Montblanc Fountain Pen. A Montblanc pen retails for roughly €750, perhaps we'll see the Prince using it in the near future? 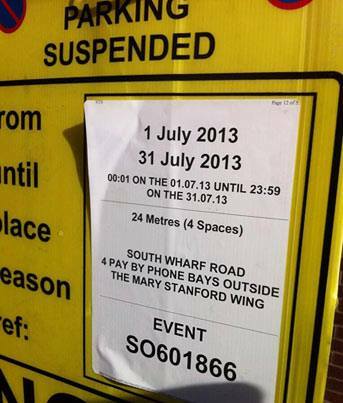 It's the first of July and somewhere in St Mary's Hospital, near the Lindo Wing where Kate will give birth, parking has been suspended for "EVENT SO601866" (the royal baby's arrival). The suspension across four parking bays guarantees Kate and her protection officers have plenty of room to park when she goes into labour. The parking suspension will also make it easier for relatives to visit once Baby Cambridge is born. It really could be any day now, couldn't it? Sky's Paul Harrison shared this photo. It's really exciting that the time has almost come! Even though I would love to see Kate one last time in public, her bump looks soooo cute. Thanks for the posting, we do not have Baby Cambridge souvenirs here, but I like the sleepsuits pretty much. Love your blog Charlotte! Been following a while, finally signed up so I can post. Very excited for baby Cambridge. Thanks for all your hard work! Will be checking in daily. love all the charity work you're doing!!! Charlotte is there any way I can buy like the saucer and tea cup. It is so cute and I would like to have something to remember the birth of baby Cambridge. Thanks for the cute post and to let us know about the blog switch. Robin, you can purchase them online from Harrod's, but there's a 25 pound shipping charge for anything coming to the US. Yep...25 pounds, so that's 38 US dollars....very expensive. I somehow left my bag of souvenirs from Harrod's on the plane when I arrived home and was sick about it. It was a few gifts, but to repurchase them and pay the shipping on top of that would cost so much. I loved the set from Harrod's also and would love to have the dish and cup! 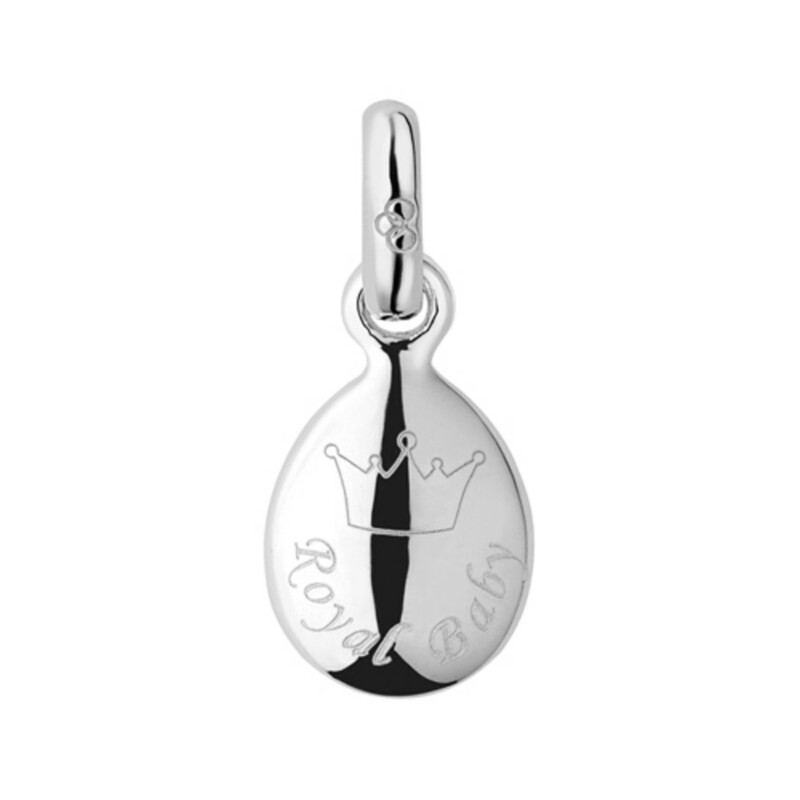 Check with other sites on Royal baby memorabilia and I am sure you will find something! Kate thank you for the information I am sure you were sick about it. Can't the airlines do anything for you? I will check out the web site and I do hope your daughter had a lovely birthday. Try to stay cool for we have another day of rain and cool temps. Have not had a chance to enjoy my small pool this year bummer. On a brighter side baby news soon so excited. Hoped you got my email from Charlotte would love to chat about cost going to London. Thanks again Kate. Oh my god the mug from Harrods is absolutely wonderful! Too bad I don't live in the UK, shipping to Europe costs 20 pound, as much as the mug itself. It's really pricey for me, but I think I'm going to give some thought to it. Maybe it will be available somewhere for less expensive shipping costs. I'm sure memorabilia will be popping up on ebay/Amazon and everywhere we can think of in the coming weeks. The price of shipping is just insane! I just replied to Robin about the shipping costs and they are ridiculous! M, I'm not sure about The Netherlands, but the US in in "Zone C" for Harrod's shipping, so it's 25 pounds or $38.00 for us. Absolutely crazy! I hope you find something to purchase and treasure on this amazing occasion! This post was a lot of fun to read. Thank you. I read the Telegraph's article last night about "baby fever." There is a photograph of a darling glass rocking horse. It is the first photograph under the headline. It looks like Lenox, but I wonder if it is Harrods or Wedgewood instead. Could you please find out? The article does not credit the artist or the store. I have emailed the Telegraph and will let you know as soon as they write back. Thank you very much Sara! So many of those baby things are just too cute! My Granny is the Queen made me smile. I am about to have a melt down waiting for this baby and I am still hoping for a girl. Oh, and Happy Birthday Di! How I hate that you aren't here. Thanks Charlotte for the unexpected report. Most intrigued by the parking ban--must assume that the birth is expected any time--and the hospital ought to know. I have seen pictures of the media already gathered outside the hospital---let's hope they do not block the entrance. Wouldn't it be funny if William and the Duchess pull a fast one on the media and have their baby at another hospital. I think this is something William would do since he does not like the medai very much. Hi Charlotte baby fever is everywhere! I have the HTC one phone and it scrolls facebook and Twitter etc. Ran across this spa contest to NYC by In Style on Facebook you had to guess the correct gender, name, and date of birth. Out of the thousands of entrys their is a chance I could win lol. It's the fun about it and seeing if you are remotely close. I put down a Girl. Name: Victoria Elizabeth Diana Carole, Born: July 9, 2013. Happy Birthday HRH Diana Princess Of Wales love you and miss you. You would be so proud now knowing you were to be a grandma. I know you are watching down from heaven guiding William and Catherine as they become parents themselves. That's very sweet Robin. I typed a little message myself. I do miss her and wonder often how life would have been had the terrible accident not happened. She would definitely be over the moon about becoming a grandmother! I think we all agree she would have been so proud of William and Harry and would have absolutely adored Kate. :) So many people miss her! It has to be so weird to be as pregnant as she is and know that your birth is going to be international news, seeing questions about your baby's gender splashed across buses, having commemorative china introduced...it's one thing to have such a public wedding, but entirely another to have a public child. I don't envy them that. But just like everyone else....SO excited for baby Cambridge to make his/her entrance. Charlotte, I know you must be on high alert these days! Wondering if there's any news??? Wishing Princess Diana a very happy birthday in heaven. She's truly having the best birthday celebration ever! I know she will be smiling down and filled with joy at the birth of her first grandchild. She would be so proud of William, Harry, and especially Kate. I know William and Harry will have many stories and memories to share. I still love her as much as I did as a child. :-) Happy Birthday Your Highness! Kate looks adorable in the magazine cover pics. She's so small, but looks healthy. I had large 10 lb babies, so I looked like her around 5 months...LOL!!! She looks just beautiful! SO excited for her and William!!! I love all the contests and excitement! I am wondering if any reporter or you Charlotte are getting any sleep? Everyone is obviously ready and on alert...especially with the parking ban. It's all so exciting! I right there with you Jacqueline I adore the Harrods baby mug. I never buy anything special for me and being on summer break money is tight. ( I teach school ) This occasion calls for it and I will regret if I don't purchase it. Charlotte how are you doing? Are you glued to your computor, cell phone and television for news? Does your fiance have the same amount of excitement or is he a little more low key about it all? What is the feeling and talk like in the cities, towns and villages of England? Oh you wouldn't believe it! My fiancé is very relaxed and "has a feeling" it will all happen quite early in the morning (I'm sure he's not just saying that to get a peaceful nights sleep without the laptop and cell on :)). How are you Sarah? I've been thinking of you since your sad news. Charlotte, that is so funny. Just like a guy. My husband would always say to me "so do you want me to freak out" when I'd try to get out of him the same emotional responces as me. Really it's nice to have one calm one in the bunch. Ha. Thank you for your thoughts. We are all doing better. So thankful for the time we did have with my husbands father and the great example he was to us all. He was 83 what a different generation. They were so grateful for what they had or have. Hard working s nd taking nothing for granted. Things have been crazy these past few days so I couldn't answer your replies properly. My dad is better now, but is still at the intensive care unit. I really appreciate your thoughts and prayers. Thank you for your support during such a difficult time. Really, I can't say thank you enough. You are such good people. I'm sending a big hug to each and everyone of you. I thought it was a great idea to buy a special pen to William as a birthday gift. When you know someone for such a long time it gets difficult to surprise your loved one when it comes to presents. Can't wait to Baby Cambridge! I'm definetely going to buy some memorabilia this time! But I'll probably import a mug since here we won't have anything like that. So relieved to hear your dad is doing better. You sound better too. Take care. I hope every day is a better day for your dad, Ana! Well i know that even charles delighted to be grandfather i wish that princess diana would see william and catherine child i and i know they will be great parents of course they will protect their child from the public and i know that will be there on their child special events on his or her life we are high alert in this point waiting for the royal baby happy canada day to all you visit blog and commenting here happy birthday princess diana i know she watching heaven to william and catherine baby the press are too crazy..
Charlotte do you think there is a possibility that Kate may deliver her baby in other hospital? Maybe the couple intentionally wants to mislead the public and later they'll say the Duchess was far away from St Mary's Hospital to go and deliver her baby there ? I don't the Palace would deliberately mislead but I have no doubt contingency plans are in place at the Royal Berkshire Hospital. Hmmm . . . maybe I'll buy myself a Mont Blanc pen to commemorate the royal birth--and it would also remind me of the royal parents. I don't know why fountain pens appeal to me so much, but they do. I was in England a few weeks after Prince William was born and happened to be on the right street corner when Prince Charles drove past with his officer in the passenger seat of his little Ford car. My friends and I were very excited! I actually got a decent picture of him driving. He was doing something official at the Royal Opera House at Covent Garden, and he waved--seemingly at us--as he got out of the car. We did not faint. But it was a close thing. Charlotte, your blog is a delight from beginning to end. I hit a wrong key as I was typing and accidentally sent a message that wasn't finished. Oh well! What an interesting story Marci! Thank you so much for commenting.